We heard probably a year ago that a new "Beauty and the Beast" movie was coming out and it's releasing the day after Hollis' birthday. We began a countdown immediately at our house. Belle is our favorite character and we cannot WAIT to go see the movie. I have been trying to talk Hollis into a movie birthday party to include seeing it. We saw it on the local stage this past fall and my girls were just captivated by it. We love Belle for so many reasons. She's smart. She loves to read. She's kind. She's brave. 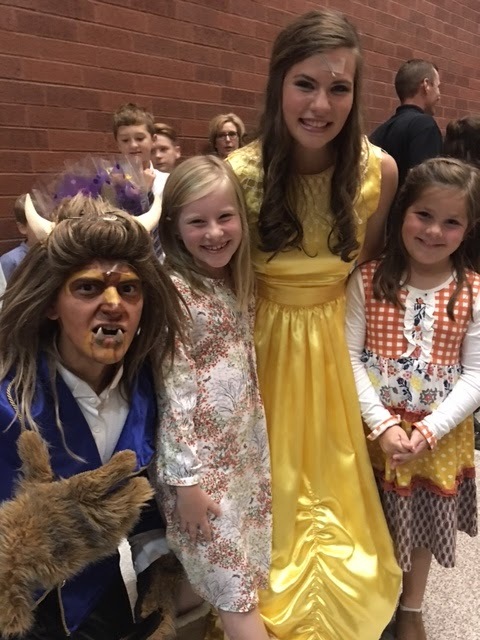 But what I love best about her and what character trait I most hope my girls will learn from her and emulate is that she sees the Beast for what is inside and not what his outer appearance looks like. She gets to know him for who he is and loves him not for how he looks but for his heart. I want my children to have the same love for people everywhere. If only the whole world would have the same thoughts - it would be a very different place, we live in. The story of Belle and the Beast can truly be an inspiration to us all. 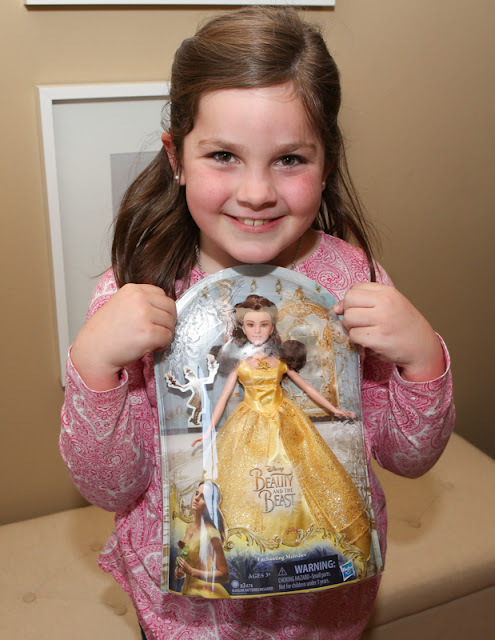 And Toys”R”Us has a whole new line of Beauty and the Beast toys that your girls (and boys) will love. More lifelike dolls and a bigger assortment of toys than ever before from this timeless classic. 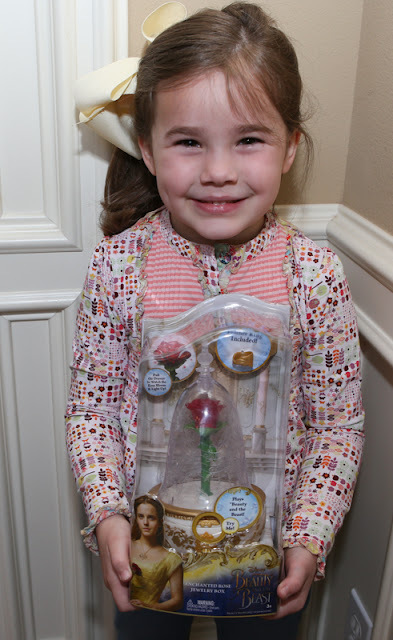 We loved this jewelry box that is like the rose in a glass case. The rose lights up and plays the theme song and it comes with a ring to keep in the box. My girls love jewelry almost as much as they love Belle. They have played with this so much. You can find all the new products HERE. 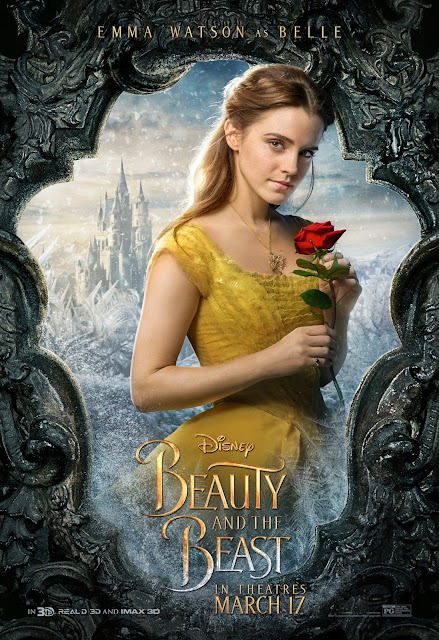 Enter the contest below to win some great Beauty and the Beast prizes!!!!! □ Weekly Product Prizes – 4 items in total to raffle off during the Sweepstakes. Plus, don't miss the Toys"R"Us In-Store Event: Visit your local Toys”R”Us to Celebrate this Timeless Tale. Build a Beauty and the Beast Lego item and more on March 25,2017 12 - 2pm. Check your local store for details.